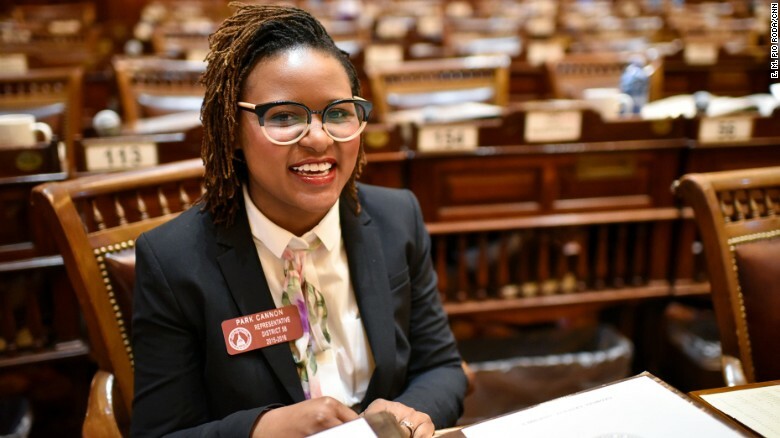 My name is Park Cannon and I’m proud to be the Democratic State Representative for Georgia House District 58. I’m out and proud that my family and I are long-time Old Fourth Ward residents. I’m a Georgia girl born to my father, a Vietnam veteran who retired Master Sergeant at the Albany Marine Corps Logistics Base, and my mother, a pharmaceutical rep from Camilla. I was born at Phoebe Putney Memorial Hospital, near Albany State College, and from very early on, I studied the civil rights movement and frequented the spots visited by Martin Luther King, Jr. I’m a proud Georgia public school kid, just like my older brother. It was there I had one of my earliest political memories: watching local residents drive around with confederate flags and KKK materials. I was a young, publicly politicized, African-American woman before President Obama was first elected. In celebration of his nomination I created an original modern dance piece entitled “Yes, we can!” and performed it in front of the school. I graduated high school and attended Chapman University in Los Angeles. It was a culture change for me, and like many 18 year olds who are out on their own for their first time I hit some bumps along the way. That situation strengthened my desire for social justice and broadened my view of the world. I entered the workforce and enrolled at the University of North Carolina – Chapel Hill to graduate with two majors – Hispanic Linguistics and Linguistics – and a minor in women’s and gender studies. While at Chapel Hill I spent my summers in Ecuador, Mexico, Portugal, and in the Old Fourth Ward. I graduated with a job offer from The Feminist Health Center, in the heart of Atlanta. Immediately after graduation, I began work in Black Women’s health promotion and lobbied as a health advocate. At the clinic, I used my Spanish fluency daily, and met Rep. Simone Bell, a staunch pro-choice ally at the Capitol. When Rep. Bell announced she was accepting a new position at Lambda Legal, she personally called me to ask if I would run for her seat. Since we share a profound love for people and advocacy, we both knew this was an opportunity to realize my dream of helping people through policymaking. I ran for this seat because I represent what is lacking at the Capitol. Women are dramatically underrepresented. We make up 54% of the state’s population yet are only 23% of the elected officials. The statistics involving African-American women are even worse. I have locked hair. I identify as queer. I grew up in a single parent household that was shaped by domestic violence. I love my middle class multi-generational home. I grew up with celebrities’ kids and kids who went home to no lights. I was even homeless for a semester in college. I think that where you come from and what you have seen along the way matters, as we are made of these experiences. There is not ONE District 58 – there is a rainbow of experiences and needs. There is not ONE Georgia – there is a sea of working families and small businesses that need a voice. As your State Representative, I will continue to advocate for growth in our neighborhoods to be balanced, smart and neighborhood-approved. I will work every day to bring more good jobs to our families. I will continue to be a strong ally to our local schools. I will work to increase affordable healthcare for all, not just for some. When I’m not working, I’m dancing. I love modern dance and use it as a healing practice. I have toured with NYC dance companies and created reproductive justice dance pieces. Today, I live in the Old Fourth Ward in the condo my grandparents bought many years ago. I am two blocks from Emory Hospital, the Civic Center, and most importantly: Krispy Kreme. Most days I will choose to have meetings at Krispy Kreme. I’m also a proud doggie-mom. Nellie is a four-year-old black Whippet I adopted from the Atlanta Humane Society. She loves kids. She has a very curly tail. She thinks she is a lap dog and she is the world’s fastest couch potato.